An unaltered photocopy of your DD-214 displaying your US Army Infantry professional primary or secondary MOS. If your DD-214 does not display US Army Infantry status you must provide a copy of your DD-214 and a copy of military-issued orders or other documentation authorizing your US Army Infantry status. 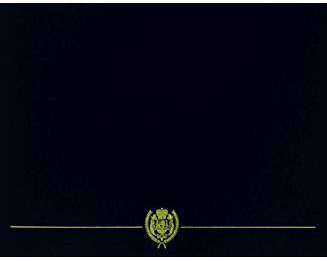 This "Special Badge" was established in 1952 by General 'Lightning Joe' Collins, United States Army Chief of Staff. 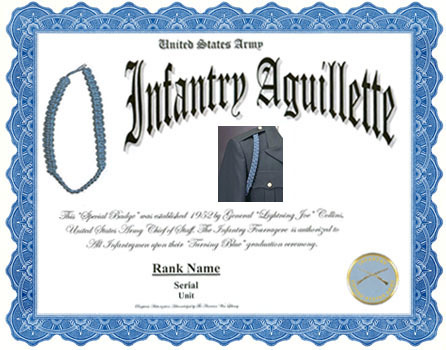 The Infantry Fourragere is authorized to All Infantrymen upon their 'Turning Blue' graduation ceremony.